Likud leadership explains why Ze'ev Elkin is the most suitable candidate for mayor of Jerusalem. 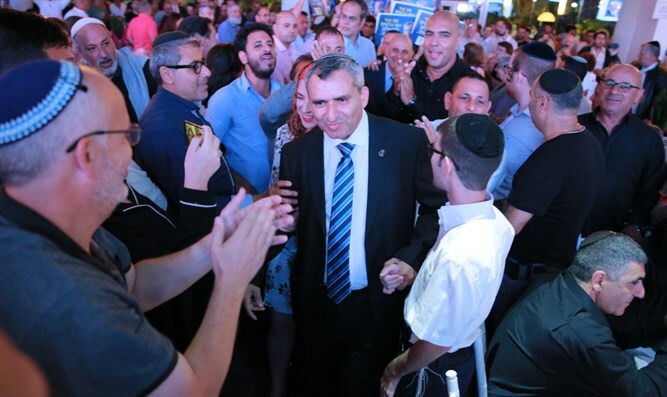 Thousands of supporters, ministers, Knesset members, Likud leaders and residents of Jerusalem arrived on Sunday evening for a toast with the Likud candidate for mayor of Jerusalem, Ze’ev Elkin. Knesset Speaker Yuli Edelstein said, "I will sign with a heavy heart the letter of resignation of Elkin from the Knesset, but I am willing to do so only for the sake of our capital, Jerusalem, because I am certain that Elkin will lead it to an even better place and to great success." Energy Minister Professor Yuval Steinitz said, "There is no man who is more serious, practical, active and wiser than Ze'ev Elkin. Ze'ev is a unique asset for the Likud and the State of Israel. The only good mayor I know for Jerusalem is Ze’ev Elkin, a wise man who suits Jerusalem." Welfare Minister Haim Katz said, "We have to remember one thing: October 30 is like the final game of a championship. Elkin is better than all the candidates and we need to get the job done. This is a final game and Jerusalem needs you, Elkin. You are worthy of leading Jerusalem. We want to win and I am at your service." Prime Minister Binyamin Netanyahu appeared in a video at the event in which he called on residents of Jerusalem to vote for Elkin in the upcoming mayoral elections.